Yet another Wallace publication from Wallace studies powerhouse, Bloomsbury. Yet another one to look forward to! 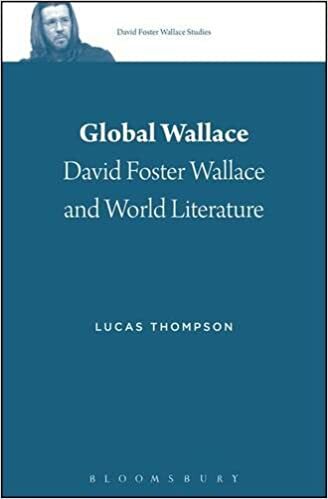 Due on the 1st of December is Lucas Thompson's, Global Wallace: David Foster Wallace and World Literature (also via Amazon). David Foster Wallace is invariably seen as an emphatically American figure. Lucas Thompson challenges this consensus, arguing that Wallace's investments in various international literary traditions are central to both his artistic practice and his critique of US culture. Thompson shows how, time and again, Wallace's fiction draws on a diverse range of global texts, appropriating various forms of world literature in the attempt to craft fiction that critiques US culture from oblique and unexpected vantage points. Using a wide range of comparative case studies, and drawing on extensive archival research, Global Wallace reveals David Foster Wallace's substantial debts to such unexpected figures as Jamaica Kincaid, Julio Cortázar, Jean Rhys, Octavio Paz, Leo Tolstoy, Zbigniew Herbert, and Albert Camus, among many others. It also offers a more comprehensive account of the key influences that Wallace scholars have already perceived, such as Fyodor Dostoevsky, Franz Kafka, and Manuel Puig. By reassessing Wallace's body of work in relation to five broadly construed geographic territories -- Latin America, Russia, Eastern Europe, France, and Africa -- the book reveals the mechanisms with which Wallace played particular literary traditions off one another, showing how he appropriated vastly different global texts within his own fiction. By expanding the geographic coordinates of Wallace's work in this way, Global Wallacereconceptualizes contemporary American fiction, as being embedded within a global exchange of texts and ideas. Some more pics via @HouseofNaqvi over on Twitter.